The design of the crop circle roughly mirrors the actual layout of the Tegra K1 chip: you can see the five square CPU cores on the bottom of the central square. The area above them is meant to indicate the GPU, which has 192 Kepler cores on the actual chip. For the crop circle, the artists flattened areas to spell out "192" in Braille. That's a strange thing to include on a piece of marketing that's intrinsically visual - maybe they think that a visually-impaired giant will be wandering by. 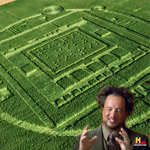 Here's NVIDIA's promotional video chronicling the creation of the Tegra crop circle. If NVIDIA wanted to create buzz leading up to its pre-CES announcement, I suppose they succeeded. The Braille-infused graphic has made its way onto local and national news sites over the last week. Unsurprisingly, at least a few UFO seekers seem to have fallen for the publicity stunt. But if you want to actually see this thing for yourself, you're out of luck - the owner of the barley field mowed down the design after it attracted too much attention from local media and UFO fanatics. NVIDIA failed to mention this in their blog post.